Whether they were real or legends, stories about sea monsters have always captured our imagination. For centuries, folks from around the world have revered the seas and rivers as primary sources of food and water. But in their traditions, they’ve often referred to them as places where horrifying monsters lurk for their next victims. 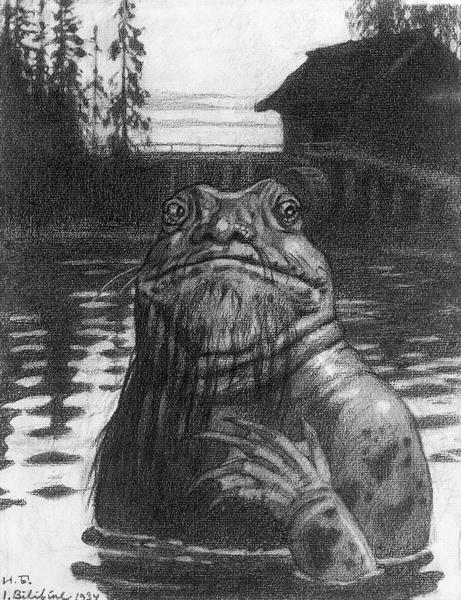 Vodyanoy is a water dwelling spirit that lives in rivers, ponds and streams. According to the East-Slavic tradition, Vodyanoy is described as a male creature with a fat flabby body, wide face covered with greenish hair and a long green beard that stretch down to his feet. For a long time, Vodyanoy has been blamed for drowning villagers and causing floods. He was also blamed for attracting and kidnapping young girls by disguising as a beautiful flower on the river’s shore. Once he captured them, he took them to a kingdom for his kind where he forced them to marry and serve him. The Slavic tradition held that Vodyanoy originated from the spirit of unbaptized man or a man who committed suicide. Therefore, he is known to be afraid of saint waters. To get rid of him, people blessed the rivers or bonds where he appeared, forcing him to leave. Fishermen, on the other hand, respected him and offered him tobacco as a gift in exchange for good fish. According to one legend, the sea bishop, also called bishop-fish, was a sea monster that was caught off the coast of Poland in 1531. The creature died few days later after refusing to eat. In another legend, a similar creature was captured alive in fishing net in the 13th century. When it was taken to the king of Poland, the Sea Bishop begged to be set free. After being released, it made the sign of the cross (which probably inspired his name) before diving back into the sea. It is thought that the Sea Bishop’s legend might have been inspired from a real sea creature known as the Giant Squid. The giant squid was first spotted by a ship crew near the Canary Islands in November, 1861. It was describe as a creature with a long tail and many arms, or “tentacles.” Above all, it had a large elliptical-shaped head that bears striking similarity to bishop’s hat. Amabie appeared in the Japanese legend during the Edo Era, when the Japanese population was dominated by agricultural societies. During this era it is said that Amabie appeared to people to whom she prophesied about a good harvest or an imminent epidemic. In one story, a city administrator went to investigate a shiny objected that appeared from surface of the sea. When he arrived at the coast Amabie appeared to him. Her body was that of a fish with scales covering all her skin. After identifying herself, Amabie prophesized saying that a good harvest would continue for six years, starting from the current year. She then told the man that if disease spread, he shall show a picture of her to those who are ill and they will become cured. Each-uisge is a vicious water-dwelling spirit that said to inhabit lakes and seas around the Scottish highlands. It is capable of shape-shifting by taking the form of a normal horse, or that of a handsome man. When it is in a horse form, the each-uisge will encourage a human to ride it. The rider will be fine as long as he stays away from a lake or sea. But as soon as the creature can sense the water of a nearby lake or sea, it will bind itself to its rider and swim to the deepest part of that lake or sea. After the rider drowns, the each-uisge will tear him apart and devour his entire body, except for the liver which floats to the surface. When it is in a human form, each-uisge can only be recognized as a monster from the seaweed hidden in its hair. The combination of a calm sea and a good weather is, with no doubt, an everyday wish for sailors. However, according to the Japanese folklore, a calm sea might be a sign for the least thing a sailor would wish for, the Umibozu. Feared by many, the Umibozu is a large sea monster that, without warning, emerges from the sea surface and destroy any nearby ship either by smashing its hulls or capsizing it. Before it appears, it infuriates the sea waves and weather conditions, creating the most horrific circumstances possible for its victims. The legend describes Umibozu as a humanoid giant with a body that consists of black skin and a bighead with a pair of huge eyes. Occasionally, instead of smashing or capsizing a ship, Umibozu demanded a barrel from its crew. It then used the barrel to pour water onto the ship’s deck, sinking it. However, if the crew members were cunning enough, they would give him a bottomless barrel. The umibozu would scoop and scoop with no effect, and the sailors would have the chance to run for their lives. In the Orkney folklore, Finfolk were dark and gloomy sorcerers that were notable for their shapeshifting abilities along with numerous other abilities and skills. They inhabited a luxurious city called Finfolkaheem that was said to be located at the bottom of the sea. They were amphibious creatures that ventured between their undersea realm and the human world whenever they pleased. For centuries, Finfolk had a reputation for abducting humans. They transport captives to their hidden island homes where they forced them to become a wife or husband for one of their own. The unfortunate humans remained there for the rest of their lives, performing their domestic duties. Finfolk are no longer seen in the Orkney Islands. Local people believe that their disappearance was blamed on the arrival of Christianity to that part of the world. Afanc is lake-monster mentioned in Welsh mythology. It is described variously as a creature that takes the form of a crocodile, giant beaver or dwarf. The afanc was said to prey on anyone who fell in or dared to enter its waters. One legend says that the violent thrashings of the afanc had caused a massive flooding which drowned all the people in Britain. Another more popular legend tells about a maiden who tamed the afanc by letting it sleep on her lap. She then called upon her fellow villagers to capture the creature and bound it in chains, while it remained on her lap. When the afanc awoke, it crushed the girl with its wild thrashings while struggling to free itself. Later legends mention that either King Arthur or Peredur had slain the afanc, bringing an end to the terror it brought to the people of Britain. According to the European folklore, Melusine is a mermaid-like creature with the upper body of a woman and the lower body of a fish or serpent. Unlike ordinary mermaids, Melusine’s lower body consists of two tails. She is said to be found in freshwater such as springs and streams. In folklore, Melusine was the name of a water-fairy who fell in love with Prince Raymond, the son of Count Poitou. Raymond is said to have found Melusine in the forest during a hunting trip. The couple fell in love the same day and Raymond asked Melusine to marry him. She agreed under the condition that he would never enter her room on Saturdays. Raymond agreed and they lived together in his palace where Melusine bore him several children. Each one of their children was born with a deformity. Nonetheless, each child grew to be a great warrior or hero. After several years, Raymond became suspicious of Melusine’s weekly seclusion and decided to take a peek into her room. He then saw her in the bath in her half-serpent form. The moment she noticed him, she jumped out of the window and disappeared into the night. Since then, she is said to appear hovering over the palace as an omen of death for one of her descendants. Abaia is described in Melanesian mythology as a large eel-like monster that lives in the bottoms of freshwater lakes in the Fiji, Solomon and Vanuatu Islands. The legend says that Abaia considers all of creatures in the lake as its children. Therefore, it killed anyone who attempted to harm or disturb them. In one legend, a man discovered a lake abundant with fish. However, the man was unaware that at the bottom of the lake lived the extremely protective Abaia. He caught so many fish that he returned the next day with the people of his village whom he had told of his discovery. The people participated in the fishing until one woman accidentally captured the Abaia, who managed to escape. The Abaia became furious at what happened to his fish. He retaliated by causing a great rain to fall during the night. The rain caused the waters of the lake to rise, flooding the village and drowning all the people except an old woman who had not eaten of the fish. In the Amazon legends, Yacuruna are water dwelling people who resemble human beings. They are often described as hairy creatures with deformed feet and heads turned backwards. Occasionally, the Yacuruna are accompanied by other creatures such as serpents or crocodiles. They live in beautiful underwater cities where they build fancy crystal palaces. Some legends say that the reflections of human cities on the water’s surface are, in fact, the Yacuruna cities. Just like the Finkfolk, the Yacuruna are notorious for abducting humans, women particularly, whom they take as brides. The abducted people will gradually transform into Yacuruna, starting with their eyes, heads then the rest of their bodies. The Yacuruna are, also, believed to be masters of healing. Hence, they are occasionally summoned by shamans to assist them in their work. If I remember correctly, kelpie was to be found around fresh water, while each-uisge (water horse) was fond of salt water. But it is also possible that these are just two names for the same thing used in different regions. Same with vodyanoy – You will find it by the name Wodny, vodnik, utopec….